PRESS RELEASE: Dye signs FiveStar for 2010. 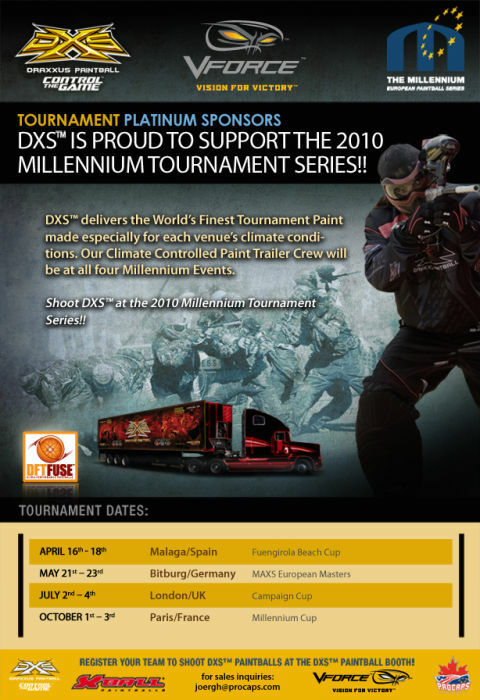 KEE Action Sports has agreed to become a Platinum Paint sponsor of the Millennium 2010 season, as part of the continued dedication to the support and growth of paintball in Europe. 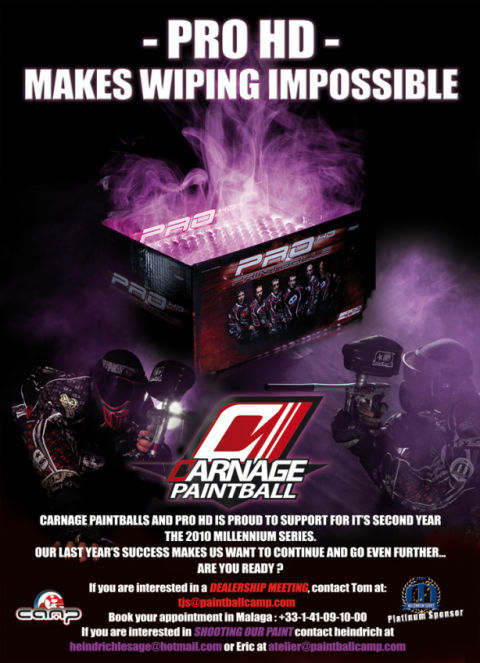 KEE and its partners will be offering a full line of the #1 paintball brand in the world RPS, and the extremely popular Carnage paint line at all the 2010 events. 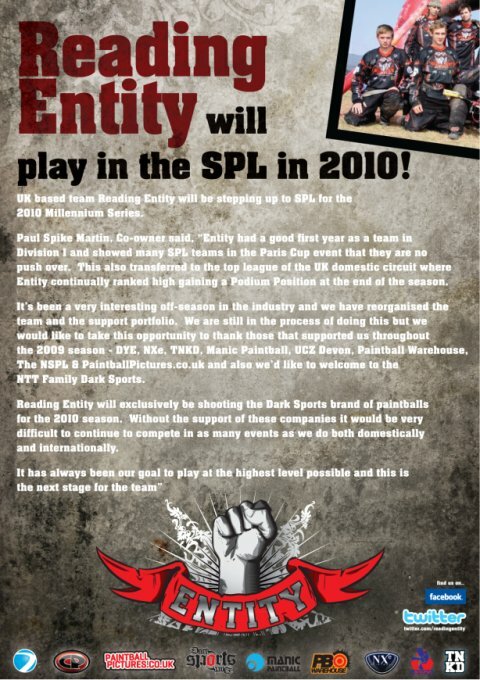 PRESS RELEASE: Reading Entity will play SPL 2010. 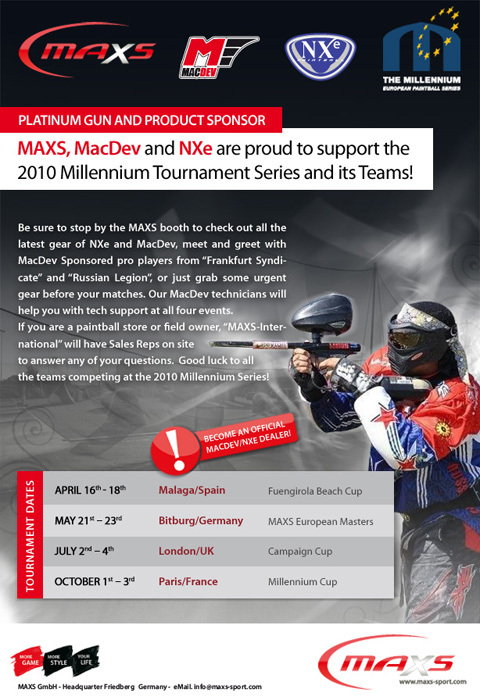 PRESS RELEASE: MAXS to be Platinum Sponsor 2010. PRESS RELEASE: Amsterdam Sabotage playing SPL 2010. 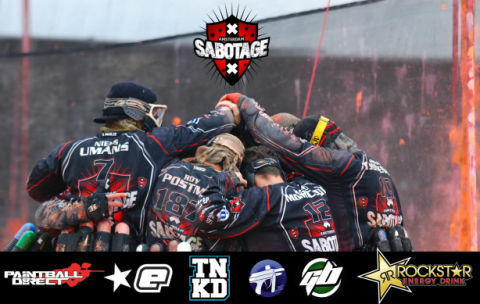 Amsterdam Sabotage entering their third year has grown bigger during the off season, not in weight, that would have been impossible having trained harder then ever before while getting ready for the SPL 2010 season! Amsterdam Sabotage has grown bigger by tapping into the growing players pool around us. Meeting up with so much up and coming talent a whole new second team has risen to compete in Division 1 under the colours of Amsterdam Sabotage. Both teams will be competing in the premier European League; The Millennium Series in both the SPL and Div 1, the DPL, our Dutch league, the NPL and helping out the Dutch paintball scene getting bigger and better. Paintball Direct , the best Dutch paintball store, supporting us from the start and making Amsterdam Sabotage happen in the first place. Planet Eclipse for supplying us with the sickest markers out there; our beloved Geos which we will continue to use for 2010 with some nice surprises later on this year. Tanked for providing us with the best and freshest looking jerseys and soft goods, making us all look like true rockstars. Rockstar energy drinks for supplying us with enough energy to keep us rolling like we do. Hoodlamb and Konekt apparel for making us look good off the field as well. JE Paintball for supporting us and helping us through the winter at their great indoor field the Crazy ranch. PRESS RELEASE: Procaps to be Platinum Sponsor 2010. The Millennium are pleased to announce that the CPL divisional draw for the first 2010 Millennium event in Malaga, Spain, will take place live on Spirit of Paint on Wednesday 31st March at 19:00 hrs CET. The results will also be available on the Millennium website from Thursday 1st April!